The Allett Classic 12E Plus is a compact, lightweight mains-electric push lawn mower ideal for bringing a close, precision finish to smaller domestic lawns up to 75m². It is equipped with a five-bladed QC (Quick Exchange) cutting cylinder as standard. 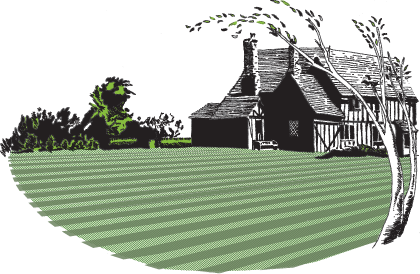 The optional QC scarifier cassette system turns the lawn mower into a powered lawn rake for lawn renovation and thatch removal. Thanks to the rear roller, the Allett Classic 12E Plus cylinder mower is perfect for achieving the traditional striped, close-cut finish. Powered by an efficient 420 watt electric motor, the Allett Classic 12E Plus is push-propelled with two stage handle to engage cylinder drive only. It has a 30cm (12") width of cut with a simple five-position hand-dial adjustment of the cutting height between 6mm - 32mm to suit the season and grass growth conditions. The long power cable allows access to most areas of the garden, whilst a large capacity grassbox minimises emptying trips. The ten blade QC cassette ensures an even closer, finer cut ideal for a professional finish to croquet and tennis lawns (not available for 12" models). Width of Cut: 30.5cm / 12"
Overall Width: 48cm / 19"
Why Allett cylinder mowers are the obvious choice. It's your decision; do you want an area of cut grass or a real lawn? If you just want your grass cutting, you may decide on a rotary machine, but if you want a beautifully presented lawn, you should choose an Allett cylinder mower. High quality, luxury grade lawns and sports surfaces are mown with Allett cylinder mowers. Their superior cut, levelness of finish and production of strong stripes makes them the obvious choice. 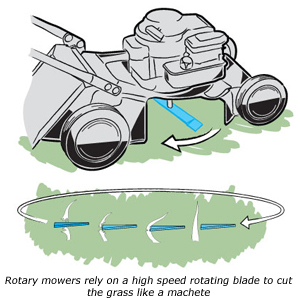 A cylinder mower cuts using a series of sharp spiral rotating blades. 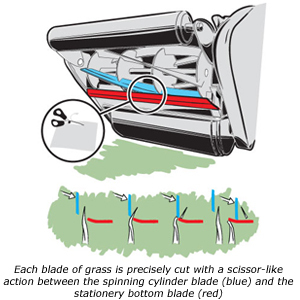 The rotating cylinder traps the blades of grass between its spinning blades and a stationary bottom blade, producing a precision, scissor-like cutting action. All quality cylinder mowers have substantial front and rear rollers. The grass is mown and then immediately rolled firmly to create a strong, clear stripe. The attractive light and dark stripes produced by a cylinder mower are recognised as being longer-lasting and more crisply-defined than those created by other mowers fitted with a rear roller alone. The front and rear rollers of a cylinder mower run close to the point at which the grass is cut. This allows very low heights of cut to be achieved accurately without scalping. On expansive lawns, a large capacity cylinder mower - such as the Allett Buckingham 30H – applies an even downward pressure as it moves across the lawn's surface, leaving no wheel marks while minimising compaction. A cylinder mower's grass box is located at the front of the machine. The contents are always visible so you know how much grass is being cut, how well the mower is cutting and whether you have the capacity to make another run across the lawn. Traditional metal cylinder mower with an excellent cut on my flat lawns. Well built but a little heavy if you have a lot of steps to negotiate. I am very happy with the appearance of my lawns even after a single pass. A very good purchase. Very pleased so far with the lawn mower. Easy to use and adjust height of the cut. I've used some cheaper (mainly plastic) alternatives to this mower that 'did the job' but the poor quality of construction was quite evident. Had a serious desire to own this type of lawn mower for some time but the cost put me off a bit. Finally decided to go for it and purchase one (especially with the scarifier option) and am absolutely delighted with it. The quality of construction is just so reassuring and feels so in use which makes it a very good value for money machine. Wished I had purchased one a long time ago! Just started using the allett classic 12E cylinder lawnmower only got a small lawn but the results are excellent, gives a really good striped finish with a really close cut. Would recommend it for anyone a appreciates a good looking or ornamental lawn.